One of the easiest things you can do to get a real appreciation of size, especially if thinking of people or wagons (as neither are too huge) is grab a photo off the internet, size it to suit your chosen scale and print it out full size. Cut it out with a bit of cereal packet card for strength and voila, a cheap an easy way to carry around your sizeometer, great for use at shows, in toy shops and model shops! What has to be remembered about 7/8th in scale is that it came about as an attempt to do 2ft gauge exactly on 45mm gauge.It did then stretch to using 32mm gauge to represent either 15in or 18in gauges. Although I was not involved in group, I did know some of those involved at the start , and I still have some of the early e-mags printed off. As a lot of the accssories used are in fact 1/12th scale I chose to adopt 1/12th scale and do a bit of rubber scaling with stock. 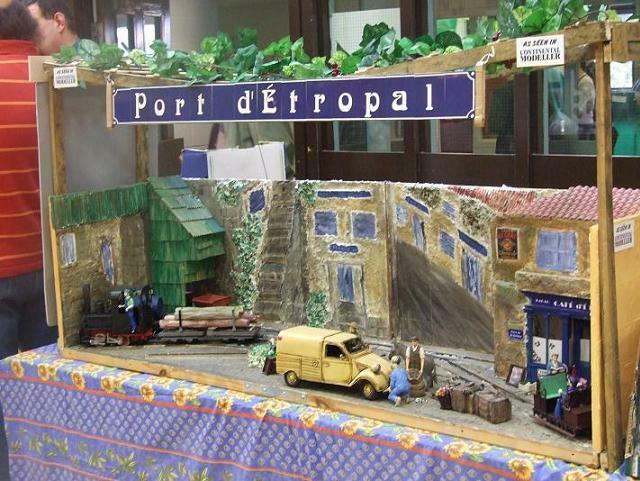 My Port d'Étropal layout resulted, using mainly LGB chassis and wagons. 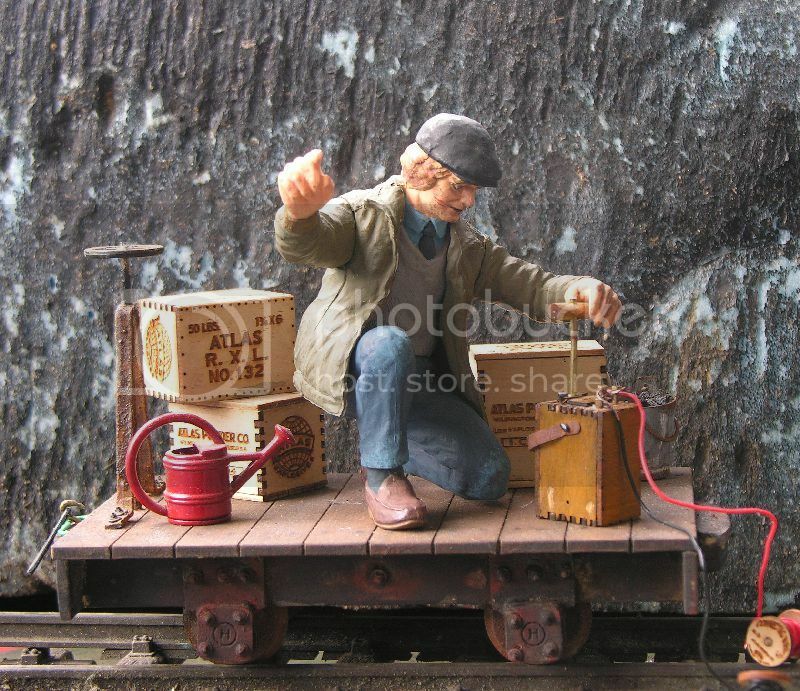 Locos are probably nearer to 7/8th scale, certainly smaller than true 1/12th, as they had a very tight loading gauge. Operation is simply moving tipper wagons around, to fill up from hopper. As I now tend to prefer talking rather than operating, I use an auto shuttle, but manual operating is still possible. It was originally intended as an easy to transport layout, but ended up being very heavy. Everything flat packs, but still fills my car. I don't know if there is any equivalent suitable for other scales, but many years ago for Sm32, it was found that figure height was roughly same as lond side of a credit card, so all you had to do in toy shops was to get credit card out (shop owner then got excited) and use it to measure any suitable looking figures. Never seen it mentioned, but found that short side of credit card is 54mm, the average height of figures for 1/32 scale! My layout is somewhere on Carl's site as well. I got round the problem of gauge by saying it was somewhere between 50cm and 60cm. 50 cm was a common industrial gauge in France, and it was all that surplus 60cm gear fro WW1 that really made that more common. Finding anything off the shelf for 7/8th is difficult, and apart from the excellent accessories available from a handful of specialists, most items available are 1/12th scale. There is so much available for the dolls house market, that it makes more sense to me to use that scale , and fudge the gauge. There is a superb range of miniature tools available from Germany. When i was just starting at shot we had a visit from their salesman(? ), and if the shop owner had not been around I would have bought a load. I did eventually get some online but at that time only way to pay was by bank transfer and that cost as much as the items bought. I suppose these days it would be possible to produce something by 3D printing, all you need is scale drawings. Given size of items they might cost a lot. I looked at replacing my scatchbuilt(and partly falling apart) cabs for my layout, but it did not seem worthwhile. I have done resized versions of my WW1 wagons for both 1/12 and 7/8 though. I am happy to use repainted LGB tipper wagons and short freight wagons including thr wine tanker! 1/12th also opens up possibility of using 32mm gauge to represent 15in or 40cm gauge. 7/8 comes out nearer to 18in gauge, so depending which you want may determine scale to adopt. This is border territory between minimum and narrow gauge. I am no rivet counter, but will point out to anyone claiming dead scale where the discrepancies are though. I prefer to look at overall feel, and if it looks right then it is right. 7/8th scale started out with some rivet counting standards, and many still keep to these, but probably stilll a lot of rule bending. I don't mind that as long as people appreciate that. The difference between 1/12th and 7/8 is virtually the same as between 1/76 (OO) and 1/87(HO) and you have to be careful if you mix those. Might be controversal, but if scale is important then it is important to understand what it is. A rectangular bit of wood as the block with some twiddly bits for a cylinder head; a piece of pipe for the tank, another small bit of pipe for a silencer and a disk of some sort as a flywheel and you only need one or two more bits to be 'there' - or close enough. Especially if you then paint it as a bit of an oily, gungy thing. One of the things about bigger scales is that more detail can be included, even making wheels/gears/pullies move so they look like they are working. That is the challenge, and can attract more attention than DCC sound, although I would expect sound as well if the motor is that detailed. 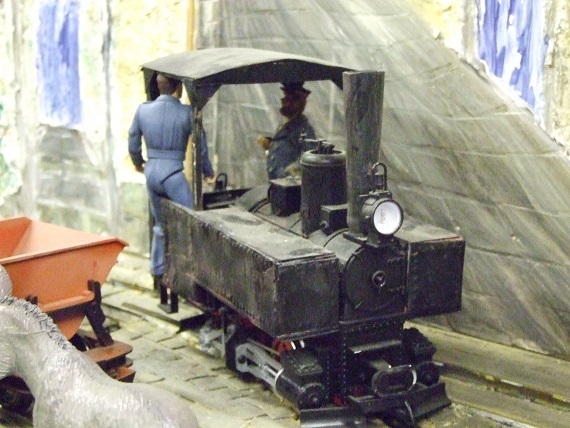 Take a look at the switcher in the models section in this website; all made from bits and bobs. I had not seen pictures of this layout , certainly not for a long time since early days of 7/8th. One of the team is welknown, namely Christian Cenac, as I found his name on one website linked to Woodpecker. I knew he was doing 7/8th scale and was one of the early pioneers in the scale. You are looking at what would be considered finescale in smaller scales. One of his first books was about some American narrow gauge railways I think. Difficult to check since his retirement and discontinuation of his books. The models do look superb, but everything is scratchbuilt, so it can be done. Not everyone wants , or can do this, so tends to resort to what can be bought off the shelf. Nothing wrong with this, as long as it is noted . 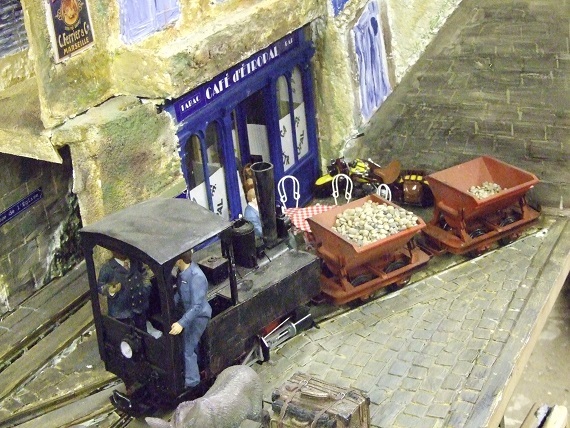 One thing I do know is that it confuses many exhibition managers, including some who should know better, and trying to explain your layout is 1/12th scale using G gauge track, and should not be listed as either G scale or even G gauge, as at best that confuses people even more. I have taken a light heated approach, and my layout now tends to have a short baguette on a couple of wagons. Neill Clayton, said it captured the spirit of Decauville, when he saw my layout at Porthmadoc a few years ago. Great thing aboutnarrow gauge is that locos and wagons vary a lot in size, even on same gauge. They are built to do a job, and restriction in height etc just result in them being mades smaller. Reason I say this is that before you commit 100% to 7/8, think about what else you plan to have. Items such as road vehicles, rare in 7/8, but can be found in 1/12(worth checking out radio control specialists). Even figures . Some available in 7/8 but there are ones in 1/12th for dolls houses. Have to be careful as some are still too big. Not sure what is available at the moment, but usually something around. I like Rob Bennett's figures, and have a few for my 1/12th scale layouts, as I think they are better proportioned for that, even though they are advertised as 7/8. I have had other 7/8 figures(bought cheap I think) from other companies and they just look too small. Then there are all the small things, any decent railway workshop will have, such as something to brew up in and drink out of. Sizing items is dead easy, one inch equals one foot. Kevin, I converted 2 of the Stainz locos, vaguely Decauville, one with open cab, one with larger Progress type cab. I also converted a Piko 060 again with later Progress type cab. All it involved was new cab, new side tanks and new chimney. Not perfect , one reason I cosidered 3D printing untill I saw the price. May still do so if I build another layout. For smaller locos I used the USA Trains motor bogie, not so easy to get hold of now, but they are on this website, along with the Hartland ones.http://www.g-bits.co.uk/prod.html I will have to dig out some pictures. As I said I had a loading gauge limitation, width was restricted, so locos are no wider than original LGB ones. Would love to have a protected Simplex, but even in 7/8 they are wide, one reason I might build another layout. I do have a square framed 20hp Simplex, built on a USA Trains chassis. Far too many locos for a small layout, so if I do build another it will have to be a loco depot. I have both versions of 1st radius LGB points, the original had break in point blades in middle not next to the frog. For inset track9pre 3D printed of course), I prefered the older points but had to settle for newer ones. Both can have electrical problems as the depend on weight to make sure contact between blades and rails are maintained, and it is not easy to solder to heavy weight brass. Anything I solder on is to rail joiners, when they are not attached torail, as it acts as a big heat sink! Although not on this layout, I have tried out Peco G gauge flexi track. No need to use special rail joiners though, as a cut just above flat base of LGB rail is right height to fit a standard Peco code 250 rail joiner. I think code 200 rail track(G1) could also be joined by a similar method. Cut would be higher, or could join LGB rail to a short length of code 250, then connect this to code 200 by similar method. This is what I would do if I was using my 3D printed track as that uses code 200 rail. LGB wheels happily go though code 200 rail track.I have even tested inonone of my 3D printed points, where back to back on wheels is potentilly bigger problem, and resulted in my having to adopt code 200 rail instead of code 100 as used on all my other track. Will make mixed gauge more difficult, also my SM32 is also code 200. I think the 7/8 group recommend the smaller profile rail. The aim originally was to have a pseudo finescale standard, so people could run models on layouts from other members.I am not sure how widespread those standards are applied now. just remembered, Tamiya used to do some F1 pit crew figures in 1/12th scale. They occasionally pop up on ebay, but command high prices. Tamiya did rerelease them a few years ago, so might do so again. As they dated from pre health safety kitted up pit crew, they can easily be used for any workshop scene. They were basically similar figures to the ones the did for 1/20th scale, jusr a pity they did not do more. Radio control boat suppliers also do a lot for 1/12th scale. I had some boat crew from a supplier in Essex , but he has now retired. pity as he also did some very reasonably priced boat kits in 1/24th scale. lots of 1/12th scale boat stuff here http://www.macsmouldings.co.uk/. They also do some bits for smaller scales. I am sure I took photos during construction of the second loco, although that might have been the bigger one on Piko chassis.Must be somewhere. Changed computers a couple of times, but everything copied. The open cabbed version is not complex. I think I actually built it before the layout, before I moved house. I remember a certain Richard Feathers coming round to show me one of the new 7/8th in scale wagons he and others were doing(kit? ), before he moved to Bulgaria! I would probably do it differently now, certainly try to make it stonger. Great thing bout the LGB loco, is that you can just unscrew parts you don't want, and use same fixings on replacement parts. rue_d_etropal wrote: just remembered, Tamiya used to do some F1 pit crew figures in 1/12th scale. They occasionally pop up on ebay, but command high prices. Tamiya did rerelease them a few years ago, so might do so again. As they dated from pre health safety kitted up pit crew, they can easily be used for any workshop scene. They were basically similar figures to the ones the did for 1/20th scale, jusr a pity they did not do more. Radio control boat suppliers also do a lot for 1/12th scales. I was looking as a set in the local hobby shop just yesterday. did not realise it was thatlong ago!! Still can find kit online, but not cheap. Compared to resin figures, price is not too bad. When they were only produced individually, the tool kit was very difficult to get hold of.I did get one of the combined sets, but sold it awhile back when I was not modelling 1/12. I still have one of the kits for the pit manager, which I think was easiest to get hold of. Found one of these Tamiya 1 /12th pit figures, assembled & painted, for 3 Euro at some figure flea market in Germany a little while ago.